It's a guy you don't expect - The Invincible M.A.E. It seems right that it would be Jonathan Sanchez to get it done. Just like getting the no hitter. :P It's a guy you don't expect. I'm crying and both horrified and amused by Posey umm... straddling Brian Wilson at the end of the game. And watching Zito's interview reminds me of another time Zito was in a locker room talking about going to the playoffs and how much love there was and how much I loved that team and how my heart was broken. Were you also horrified by Wilson SCREAMING IN TIMMY'S FACE?! Sadly, that's probably he does every day to him. :( And then it reminded me of... someone drawing Wilson's tattoos on Timmy with colored markers, except for the one that was near his crotch. I'm crying and both horrified and amused by Posey umm... straddling Brian Wilson at the end of the game. *shrieks* Posey doesn't deserve such a horrible fate! Heh. 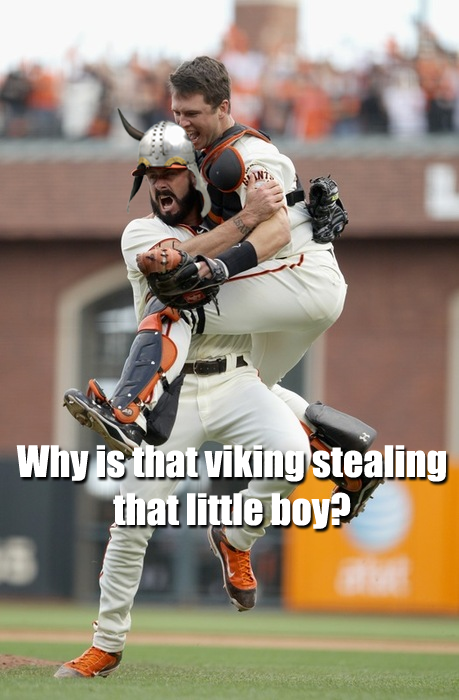 Did you see the video that soupypicturesposted of Brian Wilson screaming in Timmy's face? No, I didn't! Must go check that out. Dude. What you said about Zito so exactly summed up my feelings watching him, watching all the post-game interviews, really. I'm really happy for them, and I like a lot of these guys a lot, but Zito looks the way my heart feels, sort of badly burned and beyond repair. I'm so squeeful for Timmy and Matty and Jonathan Sanchez and Brian Wilson (ugh) and Posey and Pablo Sandoval and even Zito (in a different way). But I don't know if I can love again. Maybe that's better, it hurts less. Jaaaaaairoooo! Man, he was SO CUTE five years and about 25 pounds ago. I've only been following the Giants for the last two months, so I feel a little weird being overly invested in this. I think I'm mostly just happy for Tim. I want all the best in the world for him. Brian Wilson is alarming in general.